Disruptive Technologies: We are developing innovative solutions that focus on emerging disruptive technologies and their impacts on transportation systems with the aim of accelerating technology transfer from the research phase to the real world. These include connected travelers (vehicles and people), autonomous vehicles, shared mobility (such as a bike- or car-sharing programs), and the Internet of Things. Unconventional Big Data: C2SMART is working to make it possible to safely share data from field tests and non-traditional sensing technologies so that decision-makers can address a wide range of urban mobility problems with the best information available to them. Engagement: The Center aims to overcome institutional barriers to innovation and hear and meet the needs of city and state stakeholders, including government agencies, policy makers, the private sector, non-profit organizations, and entrepreneurs. Training and Development: As an academic institution, we are focused on training the workforce of tomorrow to deal with new mobility problems in ways that are not covered in existing transportation curricula. 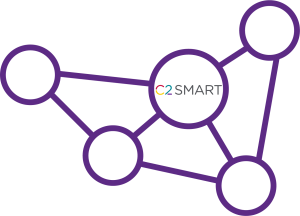 C2SMART is actively seeking to grow our network of industry, agency, and research partners in advancing transportation research and technology.